Industrial fabrics and hardware supplies were used to create these garments shown at Design Indaba 2014 by South African fashion graduate Renee Nicole Sander. For her graduate collection titled Deficiency, Renee Nicole Sander chose to experiment with PVC and padding, using the icy forms and colours of glaciers as a reference. 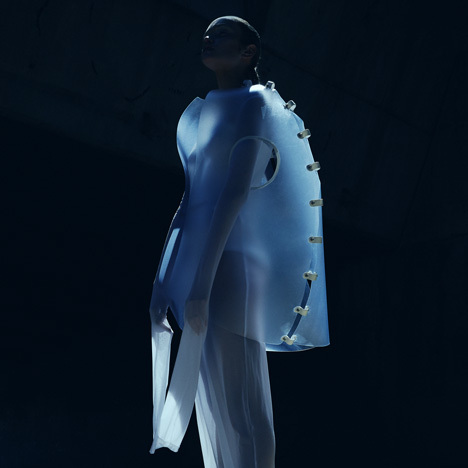 "The concept for my third year collection was glacier formations," Sander told Dezeen. "Looking at these formations from afar and close up, I was able to use these interesting shapes and textures and transfer them into my collection." She used wadding for padded quilts and blackout lining for curtains along with plastic canvas and other industrial materials to create the garments. "Although these alternative materials made an impact, construction using them proved complicated," Sander explained. "I felt it was important to look at materials outside of fabric stores and experiment with substances not often used in fashion." One piece comprises translucent PVC sheets linked with plastic ties down the sides, which look like shower curtain rungs, and large circular arm holes in the front. This is worn over trousers and a shirt with elongated sleeves that extend past the knee, both in softer translucent fabrics. Voluminous hooded coats engulf the bodies like giant sleeping bags. More commercial clothes include a loose halter-neck top and wide-legged trousers. The collection was designed purely in white to show off the silhouettes and varied textures. "Apart from the purity of white; I feel this colour represents my collection well without seeming aggressive or overwhelming to the viewer," said Sander. Sander created the collection while studying at the Cape Peninsula University of Technology in Cape Town and showed the designs during the city's Design Indaba event last month.